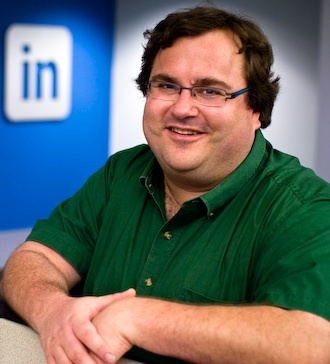 The guest post below was written by Reid Hoffman, CEO and Founder of LinkedIn. Reid, who’s been a prolific writer lately, is a strong advocate of entrepreneurism and the startup mentality. See his recent Washington Post article Let Our Start-Ups Bail Us Out, and the guest post he wrote here on TechCrunch, Stimulus 2.0: It’s The Startups, Stupid. Reid has recently appeared on Charlie Rose, and we had a chance to sit down with him earlier this year for a video interview as well. Reid is an investor in over 60 web ventures including Digg, Facebook, Flickr, Friendster, FunnyOrDie, Ning, Last.fm, Six Apart and Technorati. He is also a member of the nominating committee of our upcoming TechFellow Awards with Founders Fund. TechCrunch and Founders Fund announced the first annual TechFellow Awards last week. This is a great time to stimulate investment and recognize and encourage tech entrepreneurs –starting up is cheaper, talent is more fluid, and people are more inclined to take calculated risks. If we can find more ways to spur investment, it will be good for the entrepreneur now and good for society later. 1. How will you reach a massive audience? In real estate the wisdom says “location, location, location.” In consumer Internet, think “distribution, distribution, distribution.” Thousands of products launch every month on hundreds of thousands of new Web pages. How does a company rise above the noise to attract massive discovery and adoption? YouTube did it through existing channels like MySpace, which already reached millions. Yelp had strong SEO, which found them a mass audience searching for restaurants and nightlife. Facebook’s University-centric approach landed them 80% adoption across a campus within 60 days of launch. Every Net entrepreneur should answer these questions: How do we get to one million users? Then how do we get to 10 million users? Then how will you get deep engagement by your users. 2. What is your unique value proposition? The Internet space is crowded. A product needs to be sufficiently innovative to distinguish itself from the pack, but not so forward thinking as to alienate the user. Many entrepreneurs create incremental improvements on existing products. This can be big – Google revolutionized search when AOL and Yahoo! were presumed to have it locked up – but more often, the pitch sounds like, “It’s a dating site, but for senior citizens…” I want to see innovation that is categorically distinct from existing propositions. Digg lets users decide which headlines are newsworthy. Last.fm tracks music listening with an iTunes plugin and buffer great music discovery. Flickr enables users to share and tag photos in new ways. 3. Will your business be capital efficient? This may be the most important of the three. Even if you have a mass audience and unique value prop, a business fails without cash flow. An initial round of financing is important, but how reliable is later financing? Will investors see the right elements in the next stage? Your product must scale intelligently – this is why I like software. A well-coded site can adapt to mass demand without its capital expenditures scaling out of control. A product like TypePad can grow to 10 million users without half the growing pains of a service like WebVan, the Web 1.0 startup that attempted to deliver groceries to users’ doorsteps. Try reaching Facebook scale with a service like that. With these three elements in place – mass audience, unique value, stable funding – a startup has time to discover where it can make money. Few business plans ever pan out like their owners intend. PayPal started as a plan to beam payments between Palm Pilots. Google raised funds with a vision to capitalize on enterprise search and ended up in advertising. The formula is to build an audience with a great product – then secure enough funding to figure out how to make it pay. Since I’m focused on building LinkedIn, I’m not currently investing in new projects, but I firmly believe now is the time to take smart risks as entrepreneurs and investors. I hope these criteria help startups make better pitches as they fundraise, and maybe even encourage others to take the plunge. Good ideas need good strategy to realize their potential, and if these criteria help a few more companies find capital, it’s a win for everyone.